Factory warranty until June 17,2020 or 700 hours,whichever comes first. 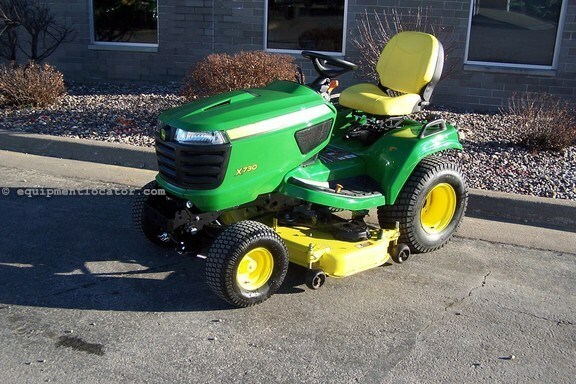 John Deere X730 garden tractor equipped with a 48" accel mower deck with a mulch control option and turf tires. Powered by a 25.5 hp Kawasaki fuel injected liquid cooled v-twin engine,hydrostatic transmission with rear differential lock,power steering,hydraulic mower deck lift,cruise control,LED instrument display with hour meter and fuel gauge,12 volt outlet,headlights and taillights,toolbox and cup holder. Great garden tractor to offer an excellent mowing quality when matched with this mower deck.